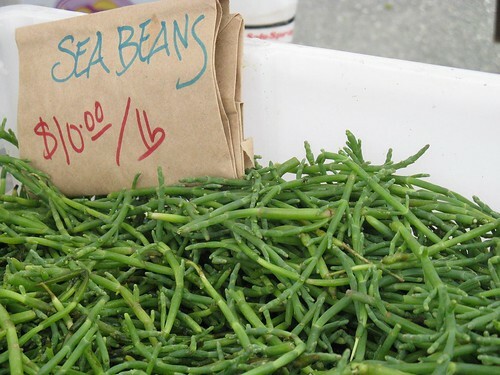 In one of those instances of weird synchronicity, we ate sea beans for the first time last Friday, and on Saturday we saw them for sale at our local farmer’s market. Of course we bought some. Then we went home and attempted to find a recipe for them in our vast array of cookbooks – not as easy as I thought. Turns out this stuff, a marsh plant, goes by a lot of different names: glasswort, sea asparagus, samphire, salicornia, pousse-pied…and most of my books don’t talk about it at all. Many people pickle it, but the Zuni Cafe cookbook has a nice recipe for fish with a topping of sea beans sauteed in butter and sprinkled with vinegar – I might try that if we get more. What we did with it was make a stirfry. 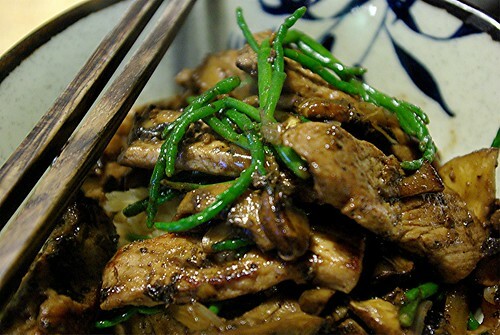 It seemed logical – the sea beans are small, crisp and salty, and cook up quickly, and I thought the flavor would work well contrasted with meat and vegetables. 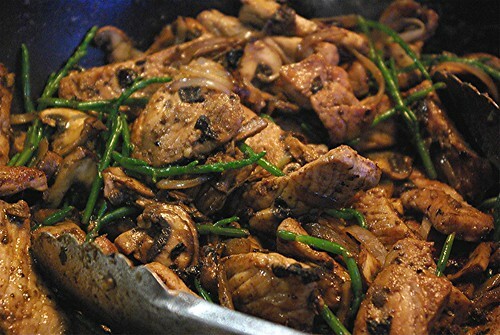 We combined them with pork marinated in black bean sauce, some sliced mushrooms, ginger and shallot, and ate it with plenty of brown rice. It was excellent – a touch salty, but the rice balanced it out. Green tea would have been a nice match, too. I have no idea how long the season is for these, but I would definitely buy them again. Anyone know any good recipes for sea beans besides pickles?